DestinUnited Methodist Churchwill hold an Easter Sunday Sunrise Service at 6 a.m. at Henderson Beach State Park. Additional services at the church include XAlt services at 9 a.m. in the Destin Life Center and traditional service at 11 a.m. in the sanctuary. The church is located at 200 Beach Drive. GraceDestin Lutheran Churchwill celebrate with a Sunrise Service at 6 a.m. on the beach at Beasley Park on Okaloosa Island. A regular service at the church will follow at 9:30 a.m. GraceDestin is located at4325 Commons Drive West in Destin. Immanuel Anglican Churchwill hold an Easter Vigil and Sunrise Service with Holy Communion at 5 a.m. in the Sanctuary. The 9 a.m. service will be traditional worship with Holy Communion. The 11:01 a.m. service will be contemporary worship with Holy Communion. Immanuel is located at 250 Indian Bayou Trail in Destin. 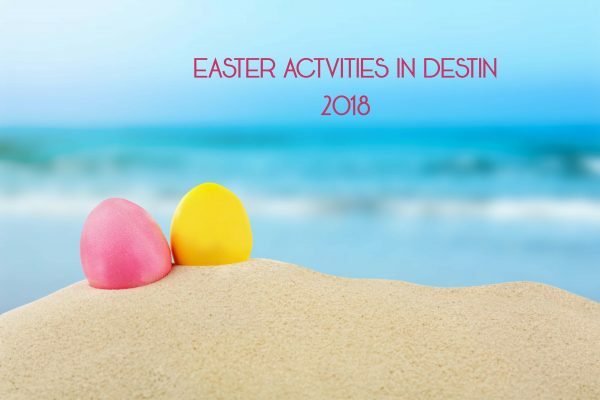 Destiny Worship Center in Miramar Beach will hold Easter services at 8, 9:30 and 11 a.m. The Destin campus is located at 122 Poinciana Blvd. There are 4 seatings for Easter Brunch: 10:00am, 11:30am, 1:00pm, and 2:30pm. Call 850.267.2305 for reservations. Easter Brunch from 10:00am to 2:00pm on Sunday April 20. Call 850-424-0622 for Reservations. After breakfast, walk off your meal at the ArtWalk on the Harbor, featuring over 40 artists and artisans. Skip the crowded Destin restaurants & cruise through a relaxing Easter Lunch buffet. Special children’s menu also available. Reservations required at www.SunQuestCruises.com or call 850.650.2519. Docked at Sandestin’s Baytowne Marina. 790 on the Gulf– Brunch is served from 11 a.m. to 3 p.m. at the restaurant in the Inn at Crystal Beach on Old Scenic 98. Louisiana-style omelets and benedicts and French Quarter beignets are classic dishes you might try … plus bottomless champagne, mimosas and bellinis. Call 850-650-4853. Callahan’s Restaurant and Deli– Alocal favorite for all meals, Callahan’s is open from 9 a.m. to 3 p.m. Sundays for brunch at 791 Harbor Boulevard. This down-home, warm restaurant is kid friendly and loves families. Callahan’s offers all the traditional breakfast favorites including omelets, pancakes, country eggs Benedict … and even several varieties of croissant sandwiches. Call 850-837-7171. Harry T’s Lighthouse — Located on the Destin harbor, 46 Harbor Blvd., Harry T’s Lighthouse is open for brunch from 10 a.m. to 2 p.m. Saturdays and Sundays. Items include various omelets, Huevos Rancheros, Breakfast Tacos and a Kids Menu with Smilie Pancakes. The circus decor is a tribute to the original Harry T., a trapeze artist in the 1900s. Call 654-4800. Mcguire’s Irish Pub — The popular Irish bar at 33 E. Hwy. 98 offers a limited specialty Irish Coffee Brunch from 11 a.m. to 2 p.m. Sundays. Favorites include a Mexican Hangover Omelet, Eggs Killarney, Shrimp & Grits … and even a steak. Bottomless champagne and mimosas are $5.99. Call 850-650-0000. The Breakfast Table Café — One of the newest restaurants in Destin, The Breakfast Table at 385 Harbor Blvd. (U.S. 98) is open 7 a.m. to 2 p.m. six days a week (closed Wednesday.) A favorite, “Granna B’s Bulls Eye,” begins with an extra large egg dropped into a cutout circle of Texas Toast. Several varieties of quiche will be on the menu, a Breakfast Sundae and waffles. Call 850-460-7322. – Brunch is served from 11 a.m. to 3 p.m. at the restaurant in the Inn at Crystal Beach on Old Scenic 98. Louisiana-style omelets and benedicts and French Quarter beignets are classic dishes you might try … plus bottomless champagne, mimosas and bellinis. Call 850-650-4853. This FREE two-day, high-flying event features professional stunt kite flying, demonstrations and lessons, and a family fun fly that is perfect for kite enthusiasts of all ages. Consider stopping by if you arrive early to Destin Before Check in. Toes in the sand and a block buster on the big screen! Enjoy a FREE Movie after a long day under the sun with refreshments and concessions available for purchase. This week we will be showing Ferdinand. Baytowne Marina from 6:00 to 8:30 pm for an evening of fun for the whole family at the Sandestin Luau! Enjoy delicious Hawaiian cuisine, live music, a bonfire, limbo, magic show, face painting, bounce house, parrot meet and greet, and much more! After enjoying the music, food and fun, cap off the evening with an amazing fireworks display over the Choctawhatchee Bay. *Must purchase tickets ahead of time. Enjoy an intimate dining room setting for a detailed and entertaining afternoon with Chef Jimmy McManus. This chef inspired interactive cooking class & lunch with a complimentary glass of wine and held in the HarborView Room. For reservations and more information call (850) 424-0622. Every Wednesday this summer stop by the Baytowne Marina Bait Shop to receive your fishing rod. The family to catch the biggest fish, and provide a picture to the bait shop when they are done, will receive a PRIZE! Watch as featured pirate Captain Davy takes you on an adventure with two magic shows on stage!